My Parents just went on an Alaskan Cruise. They had quite the experience getting there from the Charlotte Airport. First, you have to know, I am 53. That makes my parents older than me. :) Aren't they cute?? I asked my mom to write their airport experience. The story is that a young girl named Sara was on the same flight we were on, leaving Charlotte enroute to Atlanta. Our flight to Atlanta was 2 hours late leaving Charlotte due to bad weather. When we arrived in Atlanta our flight to Seattle had already left. Dad and I went to the Air Tran ticket counter and were told that there were no more flights out to Seattle until the next day. We heard this voice right behind us say "No way!" Long story short she took over right there. She looked at us and said, "Follow me"...and so we did. She proceeded to go from one ticket counter to another, each time we were told the same thing. No flights until tomorrow. Actually, a couple of flights were open that would take us to New York, Florida, etc. Still we would not get to Seattle until the next morning. Finally after two or three hours she (Sara) opened her lap top and begin to check airlines. She jumped for joy and said, "I see right here that Delta has a flight leaving Seattle at 6:00 pm." So we ran with her to the Delta counter and the agent said she saw nothing of the kind. Sara turned her computer around to show her. The agent said, "Good luck with that." So Sara got on her phone, called Delta and sure enough it was true and they had.....get this.... 3 seats left!!!! Not together seats, but who cares at this point?! They asked if the three of us were traveling together and she winked at us and said, "Yes!" It took some doing to locate our luggage, etc. But believe it or not, our stuff arrived in Seattle on time!!! Sara treated us to a late lunch in the Atlanta airport while we waited on our flight. She is originally from Idaho and moved to Seattle, where she works for a wine company and travels. Charlotte is one of her contacts. We believe she was an 'Angel Unaware'....and that we would have most likely not made it to Seattle on time to make our cruise to Alaska without her help. I DO believe in Angel's Unaware. And I am so thankful to this angel, Sara, for helping my parents navigate in unknown territory. Today I got an email from Angel Sara. My name is Sara and I got to know your parents when I was traveling from Charlotte to Seattle a few weeks ago. We missed our connecting flight in Atlanta, and thus started our crazy travel adventure together. I still am not quite sure how I became lucky enough to get stuck in an Atlanta airport with such amazing people as your parents, but I will tell you that I don’t know if I could have survived that day without them. It amazes me the way people can bond with one another during a crisis, and that’s exactly what happened to us. They were instantly like family to me….after we landed in Atlanta (at a little after 10 a.m.) we quickly became each other’s support systems - there wasn’t anything we didn’t do together – eating lunch, booking and rebooking flight after flight (I think we counted 4 different flights we were booked on), and even when we arrived at midnight in Seattle your parents waited for me to get off the plane and help me with my bags so we could walk to baggage claim together. Your parents truly are amazing and after that day they will forever hold a special place in my heart. Your mom has been texting and e-mailing me, and I now kindly refer to them as my “airport family”. what a great and inspiring story. I am so glad there are still nice people out there in the world! Sometime people really do amaze you. It makes you realize that not everyone is out to "get" you and there are still good people out there. Oh that made me teary! Thank God for our earth angels and your parents are adorable! What a great post to read as I'm ending my day!! Thanks for sharing this!! That is an awesome story. I love when people help each other out. It doesn't happen very much anymore. What an incredible post, Angela. So inspirational. I am a firm believer that God puts people in our lives for a reason. Sara was your parent's angel, for sure. Your parents are precious! 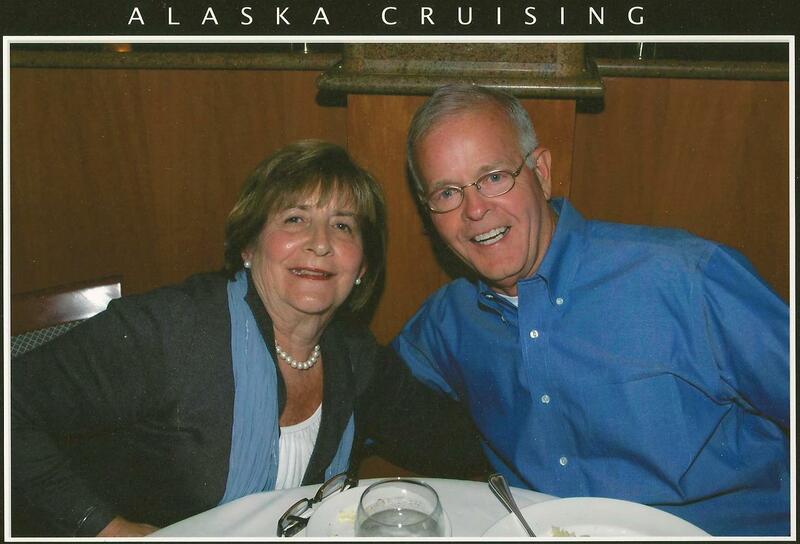 I'm sure they had a wonderful time on their Alaska cruise. Love & blessings from NC! Great story, indeed! Loved it. God places angels in front of us all the time. If only, we took the time to get to know them. I have tears Angela...so happy Sara/angel was there for your parents and them for her. It really is nice to hear stories like this...that there aret people with kind hearts that will help each other if given the chance. So cute that your mom is texting too!! Thank you sweet daughter for sharing our story. Her family is from Idaho and miss her living so far away. It meant a lot to her mom to know that people are praying for her as she travels. We indeed never know who God will put in our paths. That is such a great story. I love stories like this. I do think God provides people to take care of each other. This proves my point, that we never know what a day will hold, but we know Who holds each day:) I will remember this story for a long time. wow, this brings tears to my eyes! we have a God of details! i know you told me the story before but i still got super excited reading it!! oh my gosh that is an amazing story. What a sweet letter for her to write to you. Love hearing sweet stories like this! BTW, your parents look way young!! They are so cute! How awesome! There ARE still good people in this world who do care about one another!! A great story! restores hope of "the public". thank you. I LOVE this story! It's nice to hear of a young person using their technology and smarts to help! That is such a cool story. It's nice to hear there are still nice people out there! !